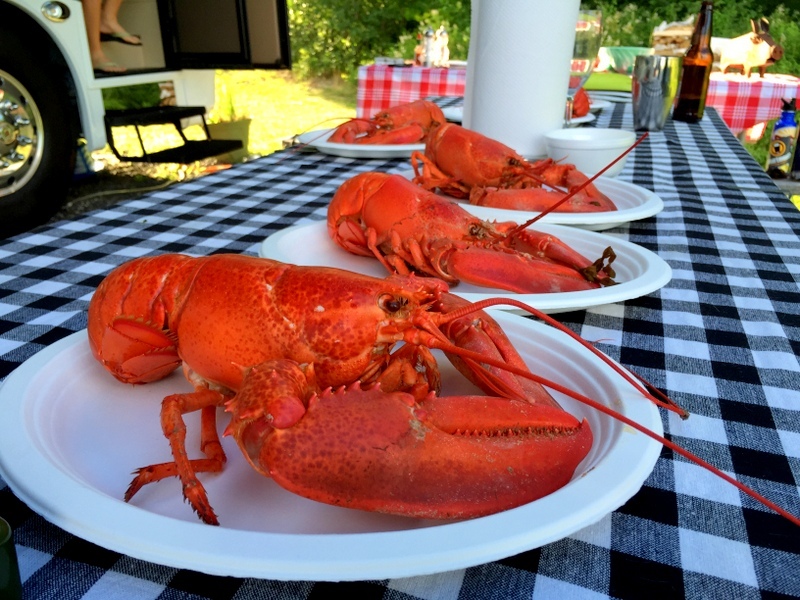 Since I admitted last week that I don’t like lobster, it might come as a surprise that we attended a lobster dinner with our friends here at the RV park a few days ago. 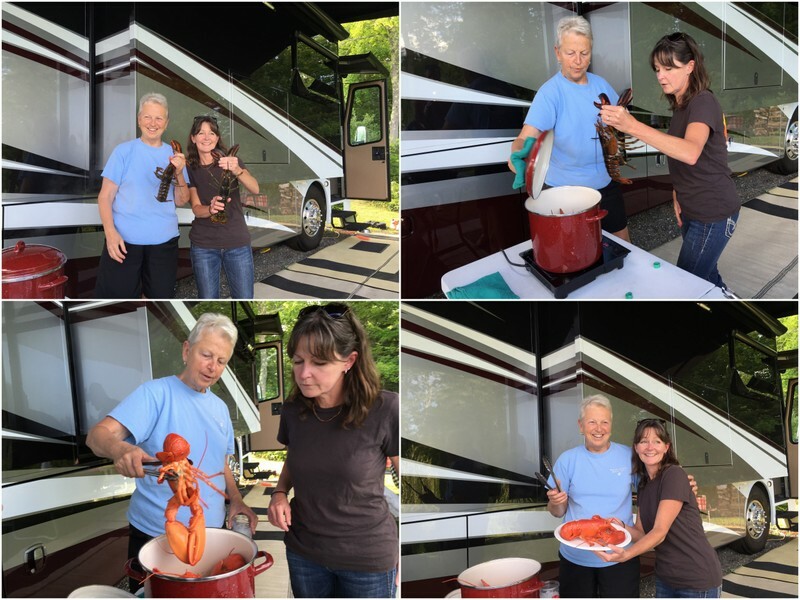 Well, it turns out that Betsy is in LOVE with lobster, and when she and Nancy invited us over for lobster night at their site we really couldn’t say no. Betsy is a true expert at cooking those critters of the sea. She gave us all a lesson on how it’s done the right way — starting with a pot of fresh from the ocean water and seaweed. Robin got to be the participant in the cooking demonstration (even though she might have referred to the cooking process as “murder” on at least one occasion). Here they are looking…good enough to eat? If you say so. 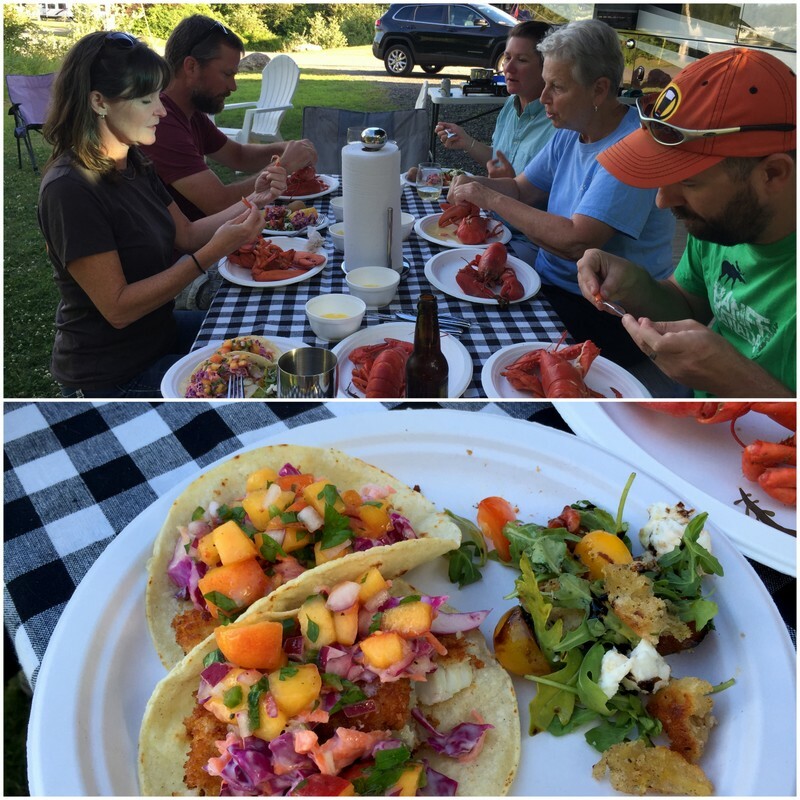 Since I wasn’t going to be partaking in the lobster feast, I brought along some of my homemade fish tacos. Remember the ones I made in the Keys? I used the same recipe, except this time I breaded and fried the fish (because if everyone else was going to be eating seafood drenched in butter, I deserved something equally as unhealthy). I also changed up the mango salsa for peach salsa since they are in season right now. It was a good choice. 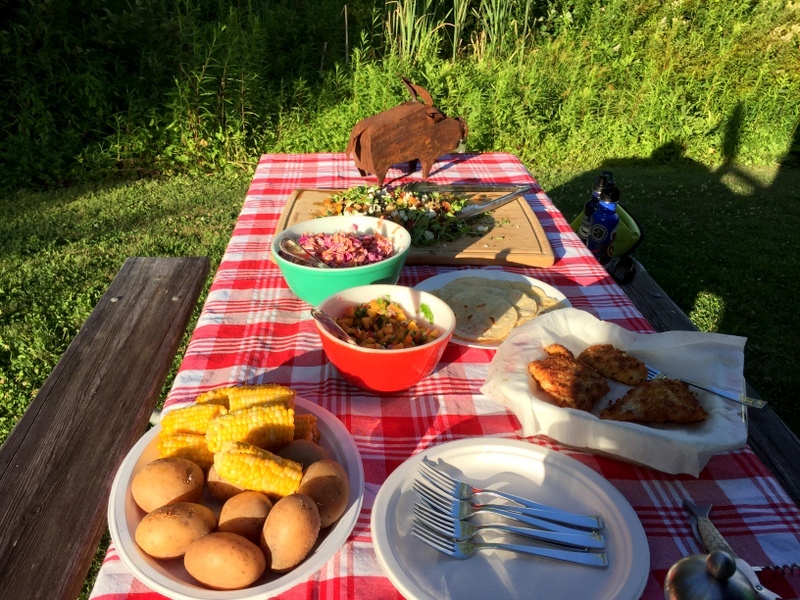 We ended up with quite a feast complete with corn, potatoes, and a tasty fresh tomato, arugula, and mozzarella salad. Yum, yum, yum. Here’s everyone working on their lobster. In addition to being an expert lobster cooker, Betsy is also an expert at eating the little buggers. She knows how to get at every little bit of edible meat, and even some of the parts that might not be edible for most. All the lobster eaters diligently followed her instructions. Nancy and I were the only ones who didn’t eat a lobster. Unlike me, Nancy likes lobster, but since Betsy eats it so often (a few times a week), she was more than happy to indulge in some fish tacos instead. 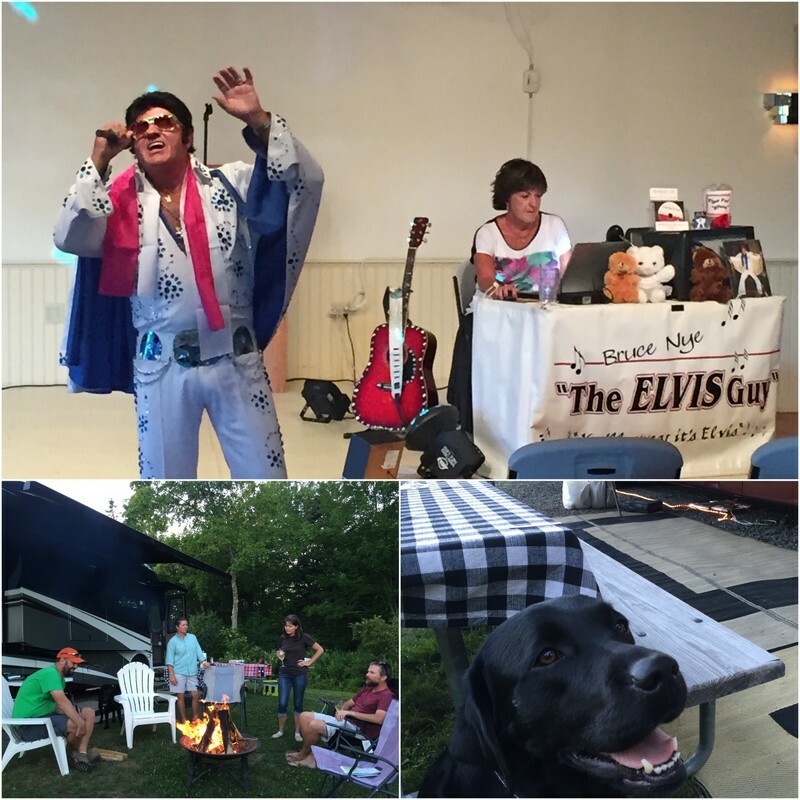 After dinner we strolled over to the activity center to catch a few minutes of the Elvis show, hung out with Nancy and Betsy’s sweet pup Spirit, and ended the night with a campfire. A perfect end to a perfect night. It’s always nice to share good food with good friends. Oh wait..did you want to know about Elvis? Apparently the king himself comes to this RV park a few times a month. He sang some of his hits, took requests, and scarred a thirteen-year-old girl for life by dancing a bit too close. I guess this is what we’re missing out on by spending all our time at public parks. Despite the antics of Elvis it was an awesome night. In fact, we had so much fun that when we got home we decided to cancel our reservation at the state park next week and spend another week here. Stay tuned. Who knows what might happen next week. It was! I hope you guys make it to Maine someday. It’s a pretty awesome state. With it that fresh, I’d have to eat the lobster for sure! Although the tacos look pretty tasty :-) Always great when you can change your plans because you’re having so much fun where you are!! Yup, we love it when we’re having so much fun that we want to stay longer! I’m afraid I would have been greedy and wanted to try both! They looked equally yummy! Enjoy your next week with friends. They were good! Reminds me that I need to be taking advantage of our proximity to fresh fish more often. Hi Gail! We heard all about you from Jen & Deas and Nancy & Betsy – all good of course :) Unfortunately, we already have plans to meet up with some friends south of here and and will be leaving this Saturday, so I think we will miss you. Hopefully we will run into each other somewhere else down the road.